Manila—(PHStocks)—Philippine stocks continue to bear the brunt of stock sell-offs. The benchmark Philippine Stock Exchange index (PSEi) opened the session at a slight 0.01% growth to 6,642.84 as of 9:30 am Monday, 4 March. The index went below 6,600pts for the first time in almost two weeks, as it declined by 0.66% to 6,598.7 as of 11:07am. At the end of the morning session, the index was down by 1.1% to 6,569.01. At the end of the trading day, however, bullish investors were able to curb the limit of losses to just 4.71pts, helping pull the index back to the 6,600-level. 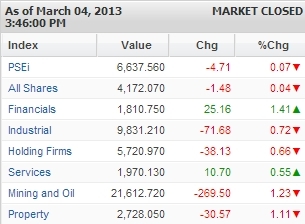 The PSEi closed today’s trading just 0.07% lower at 6,637.56. Only the Financials and the Services indices managed to edge higher today, posting 1.41% and 0.55% gains, respectively. The Mining and Oil index retreated by 1.23%, mostly dragged down by the slump in Energy Development Corporation (PSE: EDC) stocks – which are at their five-month lows now – after a landslide at its geothermal project in Leyte last week. Still, trading continued to be heavy. Value turnover reached PhP10.74 billion on 3.87 billion shares traded. There were 62 gainers against 98 losers, while 49 shares remained flat.